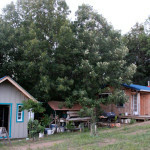 For years we have relied on a woodstove to heat our home. After several years of using a functional, but not great woodstove in our Oregon rental cabin, in 2006 we invested in a Jotul woodstove (I believe it’s an older version of this model). Not only did our Jotul burn wood more efficiently, but its top could be used as a cooking surface. We were in heaven! 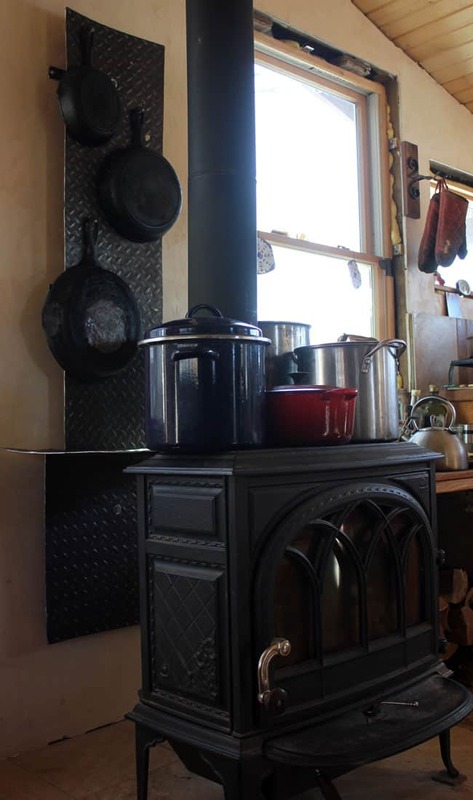 Soups, stews, and kettles of water firmly took their place on the woodstove. Our woodstove was getting crowded! We realized that while most of the time we used the woodstove surface for cooking, sometimes we just needed it for warming. 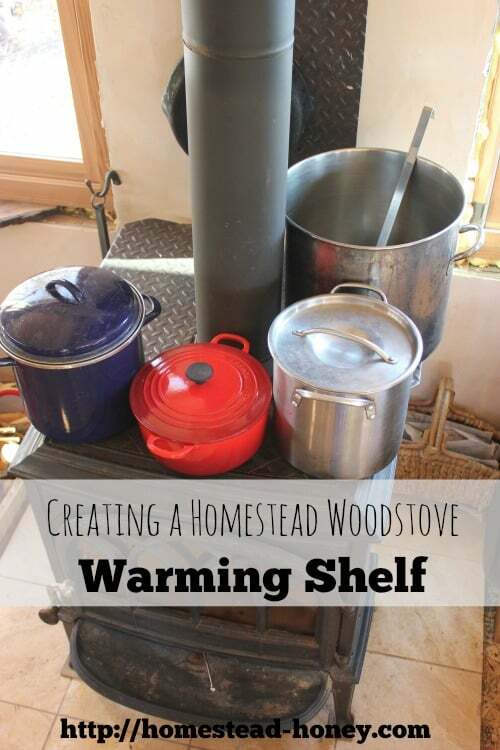 We could set a pot of icy water near the woodstove to thaw slowly, or set a dish near the woodstove to keep warm for dinner. The answer was a warming shelf. Brian found an old rusty, bent piece of 1/8″ diamond plate steel in a neighbor’s scrap pile. He cut it to shape with a cut-off blade on a Skilsaw, and wire brushed it to remove the rust. 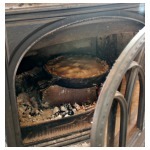 One section became a heat shield for behind the stovepipe, and another piece was custom cut to become a warming shelf. Since we’ve installed the warming shelf, it has gotten LOTS of use. We keep a very large pot of water on the shelf at all times, dipping into it for washing or animal watering. We also use it to keep our morning chai or coffee warm. One reader even recommended using it to proof rising bread, which I’m very eager to try! What a neat idea to extend the work of a stove to a cookstove! It has been working really well for us! great idea, i love it. may have to use something like it during the remodel of the old shed into new yoga studio. love the hanging cast iron too. Oh! the wood stove, Jotul F400 – if im looking at your photos correctly, ((nautical theme with a big nautical star on the inside)) we have the same one. great stove. That must be the right stove! I’m sure I have the manual lying around somewhere to confirm! Thanks! I assume it just rests on the stove. How did you attach it to the wall? Yes, it does just rest on the stove, and I didn’t show a picture, but my husband blacksmithed a metal piece to attach the heat shield to the wall. It looks a bit like a really flat letter “U”. This is very timely, as we have been shopping for wood stoves. 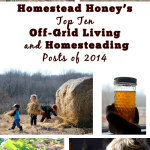 Love the homesteader ingenuity! I do love my Jotul! That is my ultimate dream! I would love to get a huge cookstove, but right now it would be overkill in our small house. If we ever get around to adding on a “grand room” like we talk about, We’ll probably try to knock down some walls and replace this woodstove with a cookstove so we can bake it in and heat water. Some day! How did you attach it to the stove? We can’t rest the metal on the top of the stove. Thank you. It’s actually not attached to the stove – it is just resting on the stove, and on some built-in notches that are part of the heat shield. You will love it! It is perfect for Missouri summers! A drying rack is one of my next projects. I really want to have something handy to dry fruit and peppers, etc.